Thank you for doing such a great job at a reasonable price. Carpets look great! If you need carpets cleaning I thoroughly recommend! I was heartbroken when i bought my property and the previous owner had smeared mascara all over the carpet-today i saw magic happen and the mascara is gone-the carpets look brand new!!! Thank you so much! Best carpet cleaner we have ever had. Would highly recommend Tom. Very impressed. Nice and friendly guy, great job and great price. Would recommend and use again. Thank you so much for the cleaning all of our carpets they look so new again, prompt message response, good communication and contact before appointment. Would recommend to anyone. Nice and friendly guy great job done great price would recommend and use again. Very pleased with their service. Thank you very much for coming to clean my front room carpet this morning. It came up so much better than I thought it would, I feel like I have a new front room this afternoon. Very quick and tidy service. Really pleased and can't wait to get my stairs done next. Had my lounge carpet cleaned today, it looks wonderful, like a brand new carpet, I'm so pleased, thank you! Definitely be using your service again! Amazing job on my carpets. Will definitely be using you again in the future. Thank you! Thank you Tom for cleaning my carpets this morning, you provided a very professional service & enjoyed talking to you. Congratulations on becoming a dad again! Thanks for today's visit FrotClean. Amazing results once again. So good seeing the carpet change colour as you moved along., Superb service and great value as always, So glad the house is pristine in time for Xmas. Just had Tom come round this evening to clean our lounge carpet. Absolutely filthy, not cleaned properly for years, but looks amazing, even the darkest stains gone. Friendly, efficient and good value. Thanks Tom! Thank you so much for the gutter cleaning this morning Tom. Frotclean was on time and gave a professional service with minimal disruption. Would highly recommend and use their services again. Thanks for the carpet and sofa clean today....I am very pleased with results. Great service and price! Tom cleaned all my carpets and gutters. Very impressed and would recommend without hesitation. we have just had 2 bedrooms and hall carpets cleaned by tom. we're very pleased with the result. he's very polite and gets on with the job, the price is good too. i will definately be recommending him. Thankyou so much for cleaning stairs landing and bedroom carpets . And the 3 large rugs all came up beautiful . Will be recommending him to everyone . Thanks again. Tom did a great job of my carpets for an affordable price, I would definitely be happy to pass his details on to anyone else needing cleaning services and will be using him again thanks tom. Thank you so much for cleaning my carpet today It’s amazing Would 100% recommend It’s like brand new. Had my sofas cleaned today by Tom . Very professional and helpful . Arrived on time and did a brilliant job . Price was very reasonable as well . Would highly recommend and will be using again . Thanks tom ! Had my carpet and landing and sofa done by Tom on Thursday thank you will deffo book again. Received an excellent service from Tom & Marcin today. Both chaps extremely friendly & thorough. My 3 piece leather sofa and my carpets look brand new!! Great job guys! Tom did a fantastic job with our carpets today. Would absolutely recommend. Top bloke! 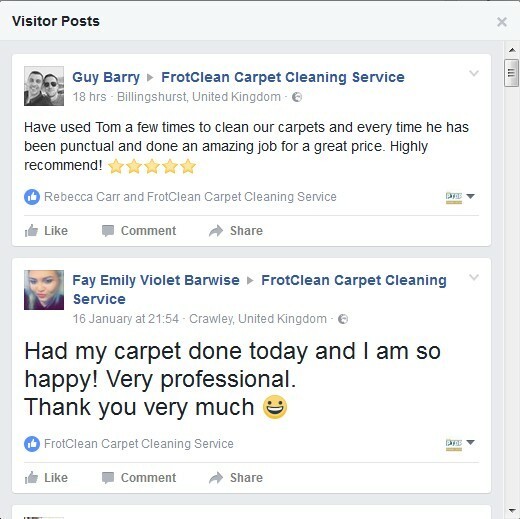 Moved into a new flat with very dirty carpets (stains and dog hair, gross), was not planning to renew them until later in the year, but they were really bad - so had FrotClean over to see if they could refresh them with a professional clean and I am very pleased with the results, the carpets are so much better and will definitely last now for another 6 months until I'm ready to replace them. Tom was on time, friendly, worked hard - highly recommended! My dad had his carpet cleaned yesterday and said how friendly and professional they were 🙂 He was so impressed, they’re going back next week to do the lounge carpet. Booking was simple and great value. They also communicated a slight delay. I couldn’t recommend them highly enough! ust had my front room carpet cleaned and very happy with it. Service was efficient, polite, and great result. Great value for money too! Marcin did a super job cleaning the house carpets yesterday. This is a very efficient, friendly and cost effective service. Highly recommended. Thank you Tom for cleaning all my carpets !!! Amazing job, professional and fantastic job. Can't recommend enough. Professional and efficient service. Would definately recommend. Tom did an excellent job cleaning all our carpets prior to us moving into our new home. The carpets look almost new and the price was reasonable. Thank you so much.